1. Obtain a sample of pond sediment or debris, plants, water, and organisms from your teacher. 2. Cover the bottom of a clear-plastic container with about 2 cm of the debris. 3. Add one or two plants to the container. 4. Carefully pour pond water into the container until it is about two-thirds full. 5. Use a net to add several organisms to the water. Seal the container. 6. Using a magnifying lens, observe as many organisms as possible. Record your observations. Return your sample to its original habitat. Write a short paragraph describing the organisms in your sample. How did the organisms interact with each other? 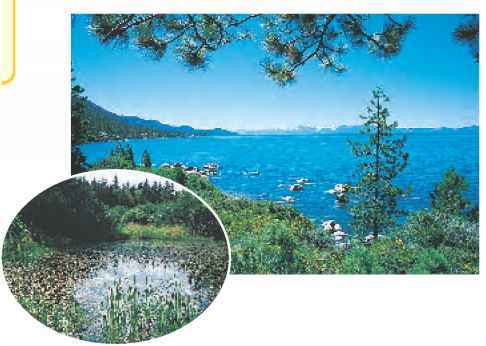 Figure 16 Ponds contain more vegetation than lakes contain. The population of organisms in the shallow water of lakes is high. Fewer types of organisms live in the deeper water. Human Impact People use rivers and streams for many activities. Once regarded as a free place to dump sewage and other pollutants, many people now recognize the damage this causes. Treating sewage and restricting pollutants have led to an improvement in the water quality in some rivers. Lakes and Ponds When a low place in the land fills with rainwater, snowmelt, or water from an overflowing stream, a lake or pond might form. Pond or lake water hardly moves. It contains more plants than flowing-water environments contain. Lakes, such as the one shown in Figure 16, are larger and deeper than ponds. They have more open water because most plant growth is limited to shallow areas along the shoreline. In fact, organisms found in the warm, sunlit waters of the shorelines often are similar to those found in ponds. If you were to dive to the bottom, you would discover few, if any, plants or algae growing. Colder temperatures and lower light levels limit the types of organisms that can live in deep lake waters. Floating in the warm, sunlit waters near the surface of freshwater lakes and ponds are microscopic algae, plants, and other organisms known as plankton. A pond is a small, shallow body of water. Because ponds are shallow, they are filled with animal and plant life. Sunlight usually penetrates to the bottom. The warm, sunlit water promotes the growth of plants and algae. In fact, many ponds are filled almost completely with plant material, so the only clear, open water is at the center. Because of the lush growth in pond environments, they tend to be high in nutrients. 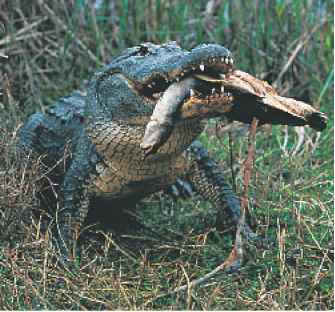 Figure 17 Life in the Florida Everglades was threatened due to pollution, drought, and draining of the water. Conservation efforts are being made in an attempt to preserve this ecosystem. Water Pollution Human activities can harm freshwater environments. Fertilizer-filled runoff from farms and lawns, as well as sewage dumped into the water, can lead to excessive growth of algae and plants in lakes and ponds. The growth and decay of these organisms reduces the oxygen level in the water, which makes it difficult for some organisms to survive. To prevent problems, sewage is treated before it is released. People also are being educated about problems associated with polluting lakes and ponds. Fines and penalties are issued to people caught polluting waterways. These controls have led to the recovery of many freshwater ecosystems. Wetlands As the name suggests, wetlands, shown in Figure 17, are regions that are wet for all or most of a year. They are found in regions that lie between landmasses and water. Other names for wetlands include swamps, bogs, and fens. Some people refer to wetlands as biological supermarkets. They are fertile ecosystems, but only plants that are adapted to waterlogged soil survive there. Wetland animals include beavers, muskrats, alligators, and the endangered bog turtle. Many migratory bird populations use wetlands as breeding grounds. Wetlands once were considered to be useless, disease-ridden places. Many were drained and destroyed to make roads, farmland, shopping centers, and housing developments. Only recently have people begun to understand the importance of wetlands. Products that come from wetlands, including fish, shellfish, cranberries, and plants, are valuable resources. Now many developers are restoring wetlands, and in most states access to land through wetlands is prohibited. Rachel Carson (1907-1964) was a scientist that turned her knowledge and love of the environment into articles and books. After 15 years as an editor for the U.S. Fish and Wildlife Service, she resigned and devoted her time to writing. She probably is known best for her book Silent Spring, in which she warned about the long-term effects of the misuse of pesticides. In your Science Journal, compile a list of other authors who write about environmental issues.